My youngest sister Hazel, who is a senior in high school, is enjoying her Spring Break this week. I invited her to have an early workout date with me this morning. 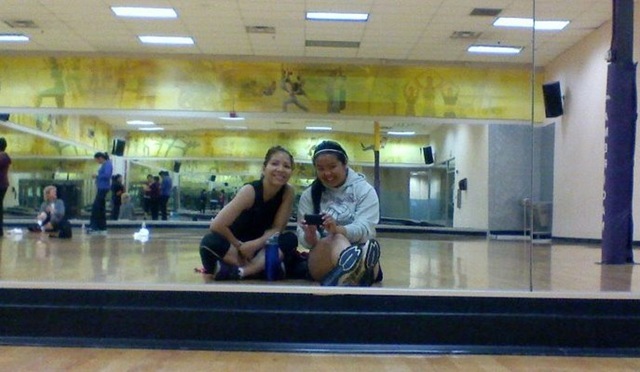 She joined me on her first ever Zumba class (and first ever gym trip). The class was different because there was sub today and she did a lot of hip hop moves, which I love because I learned different moves. But I think the older crowd much preferred the regular instructor with her slower salsa moves. My sister and I had a fun time during class. She is a hula dancer and she picked up really quickly on the moves. We shook our bootay and got our groove on. 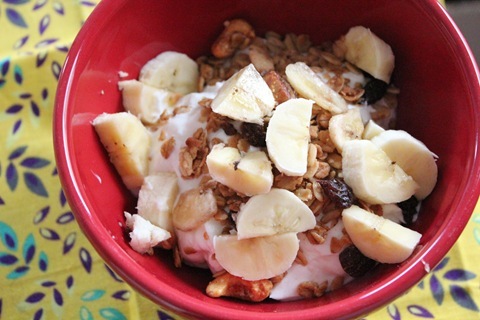 I was in the mood for a cold breakfast afterwards and fixed myself a yogurt bowl. I used to think plain greek yogurt was too tangy because I was used to eating sweet yogurt like Yoplait. After cutting back on sweets and sort of “cleaned my taste buds”, I’ve learned to appreciate the plain greek yogurt and love the taste of it now with very little sweetener. I’m happy to be back in the kitchen. As things have calm down a bit around the house, I am back doing the things I love like baking. Baking is like therapy isn’t it? I feel so calm when I’m baking. 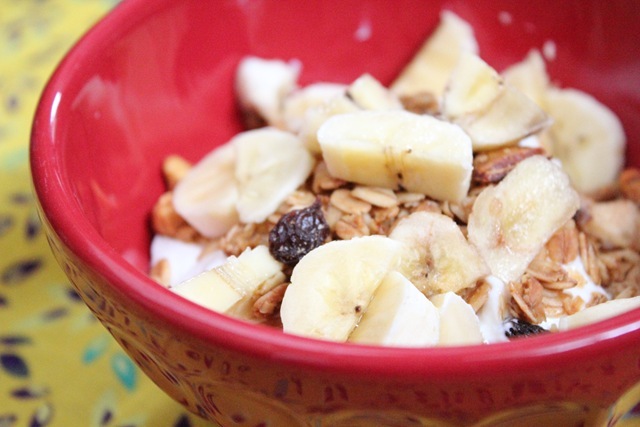 I replenished my stock of homemade granola this week and ate it with my breakfast this morning. I also baked some cookies. It has been awhile since I’ve made cookies, so I was due for a batch. 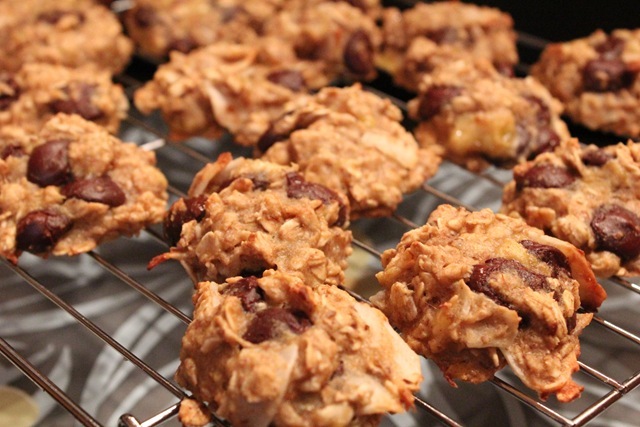 I made Oatmeal Banana Coconut cookies, recipe adapted from Anne’s blog. I followed the recipe except, I used agave, dark chocolate chips and chunky coconut flakes. In a large bowl, mix together dry ingredients. 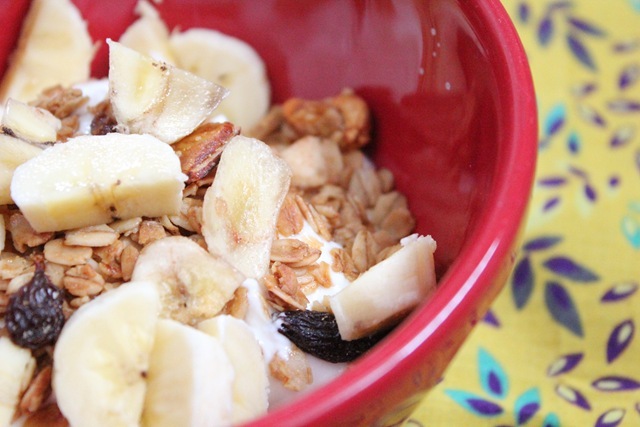 In a separate bowl, mix wet ingredients, and then slowly add wet to dry, stirring gently until mostly uniform (I like leaving a few banana chunks in the mix. 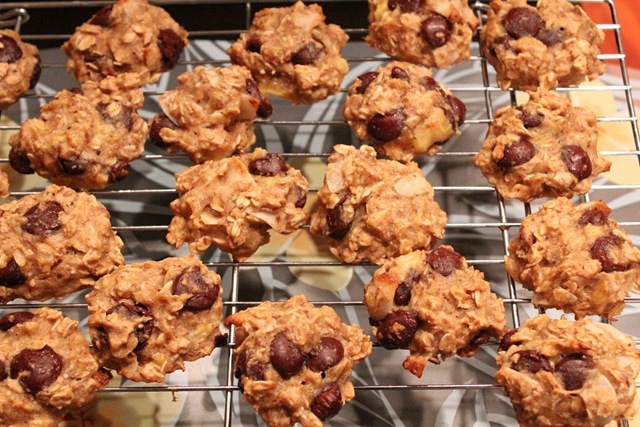 These cookies are soft because of the bananas, no crunch here. They are not crumbly, but more like a really dense cake. I’ve made this for my sister in the past and she liked them too. I got a little carried away with the chocolate. I definitely used more than the 1/2 cup noted in the recipe as you can see below. My favorite dark chocolate to use for baking is Dagoba Chocolate drops. I have to wait until I have a coupon or it’s on sale because it is pricey, but when it comes to chocolate, I definitely prefer good quality chocolate. I love texture, so choosing to use the chunky coconut flakes was great to bite into. Do you ever create something in your head, go thru the necessary steps to get it done, then you complete it and it’s not what you had envisioned in your head? Well, I had one of those projects today. First, I thought I could remove the original tag and replace it with a customize one. The tag is hard to remove without leaving the sticky film on the container. Second, the labels that I created were a tad bigger than the bottle. Oh wells. I showed it to my sister and my mom and they said it’s cute. It’s a small project so it’s no biggie. Just something fun and creative that I had pictured in my head. P.S. I created a Facebook page for the blog. Because of my free wordpress theme, I don’t have anymore room to create additional pages on my blog. With the Facebook page, I am planning to add more pictures and albums related to Fashion, Disney, favorite products and other fun stuff. 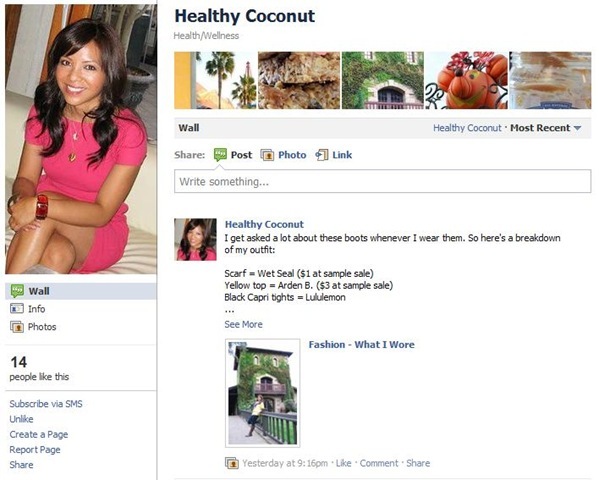 Healthy Coconut Facebook page is still work in progress but I just wanted to let you know because I will start linking to the page in the future. Plus, it’s another way to connect with you all. I know there are shy readers out there, especially my personal friends who would rather text or leave me Facebook messages than comment on the blog. What kind of activities relaxes you? Activities like baking, running and shopping can be therapy for me. Thta is so fun that you and your sis did class together! I love the name Hazel too- so cute! Baking is TOTALLY therapy (as is running and the gym in general). The cookies look yummy. I always go overboard on the chocolate. I laugh when recipes give chocolate chip measurements 🙂 I think the bottles were a great idea. 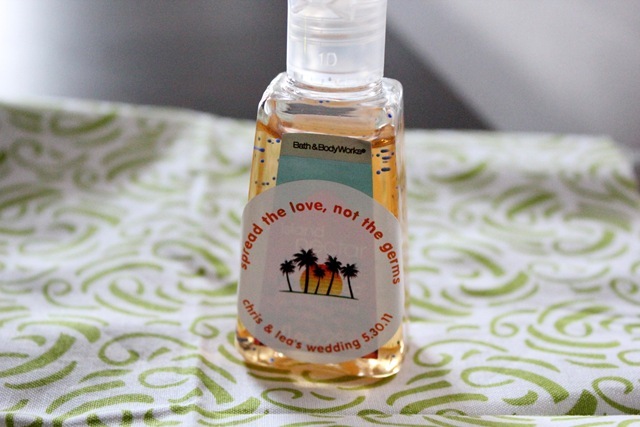 Everything for your wedding is so personal-perfect! 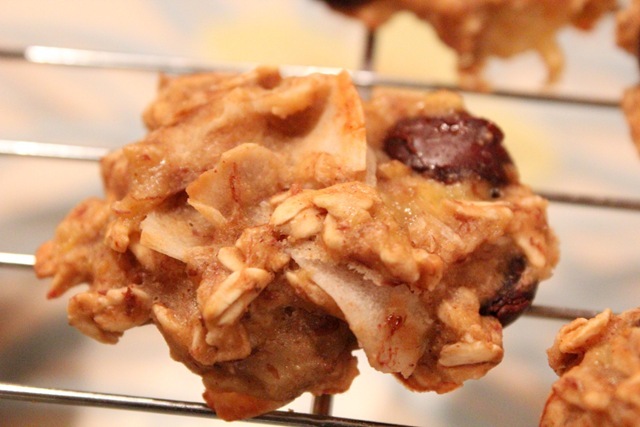 I love banana and coconut in cookies together, it makes for an awesome combination!! Well those just look darn tasty. Nom! Wine relaxes me. Pedis relax me. Reading relaxes me. And of course, baking! Baking as Therapy I can see that. it’s whatever puts you in your comfort zone and relax, if its baking then that’s what it is. That class sounds like fun, I definitely need to check it out in my area..
You have a blessed Friday. Relaxing?! Reading, taking a bubble bath, cooking, and just vegging out with the family watching TV! 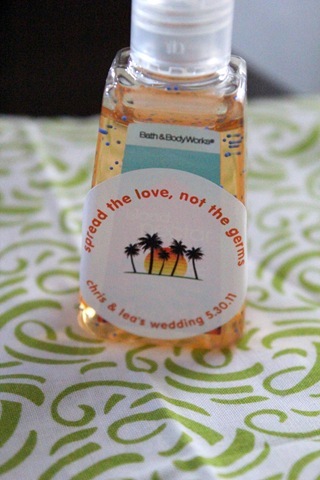 The cookies look amazing and I love the hand sanitizer wedding things! I think they are great!! love it! !